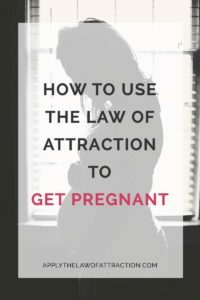 Using Law of Attraction to get pregnant is a really hot topic. I've received many questions on fertility and the Law of Attraction, having a healthy pregnancy, age, and more. Regardless of whether you, your partner, or your doctor understand how to use the Law of Attraction for fertility and pregnancy success, the Law of Attraction plays a big role in whether or not you will become pregnant and have a healthy baby. I'm going to assume you already have a basic understanding of how the Law of Attraction works. If not, you may want to begin with this article: How to Manifest, and explore this site for any other elements I mention that are new to you. No matter who you are, no matter your experiences, it is as easy to use the Law of Attraction to become pregnant as it is to create a parking space. There is no difference! The only difference lies in your mind. So far you have manifested not getting pregnant. You can just as easily manifest pregnancy success, a healthy pregnancy, and a health baby. Whatever your reason for not being pregnant is, we wouldn't be having this conversation if both of those things had happened. When you desperately want something, you don't get it. It isn't because you don't deserve it. It's because you're so attached to the outcome that you're creating the absence of what you want. If you NEED something, you are focused on not having it which only creates more not having it. If you NEED something, you can't line up with it vibrationally. If you NEED a baby, you are focusing your attention on how you are not pregnant and don't have a baby right now. You are vibrationally aligned with not having a baby. You can't think and feel lack of a pregnancy or lack of a baby. You won't attract getting pregnant to you if you do. You have to change your attitude about being pregnant. The solution is to let go and detach from the outcome. This means being in a place where you are okay with not getting what you want. You are happy and feel good no matter what happens. This causes you to stop focusing on reality, allowing the energy to shift and start flowing towards creating what you do want. The key is to get to the point where when you think about having a baby, you don't think about how you don't have one at the same time. You have to start feeling how you would feel if you were already pregnant. When you're pregnant, you don't have a baby yet. You know it's on its way, but you don't care how long it takes for the baby to be finished. You're happy that you're pregnant and are expecting to meet your baby. But when you're trying to conceive, you're panicked if you don't conceive immediately. Something must be wrong if it takes two weeks, two months, a year. You start worrying that it will never happen. Just as it takes as long as it needs to take for the baby to be born once you're pregnant, it takes as long as it needs to take for you to conceive. Just relax and enjoy the journey. It isn't about the final outcome. It's about having fun the whole way there. Spend as much time as you can playing with the idea of pregnancy. 1. What would you do if you were pregnant? Would you have a list of items you need to buy before the baby arrives? What would you need to do before the baby was born? 2. How would it feel to be a mother/father? Imagine bringing your newborn baby home, carrying your baby from the car into the house. Imagine what your baby's smile will look like. You know why you want a child, and how you will act and feel once you have one. Let these things be your inspiration. Allow all of your actions come from this place, even ones that have nothing to do with fertility or becoming pregnant. You have given your order for a pregnancy and a baby of your own to the Universe. Relax and allow it to happen. Be at peace with everything. Know that everything is perfect and working out for the best. It's really about getting into alignment with becoming pregnant and having a healthy pregnancy. Your baby already exists vibrationally. He/she came into existence as soon as you had the desire to have a baby. You just have to enjoy your life. Trust that you will meet your baby. Know that you are exactly where you need to be in order to get what you want. The Universe has heard your request for fertility and a healthy pregnancy…and it has answered. That means it is time to stop feeling the lack of being pregnant. Do the things that make you happy – dancing, walking on the beach – whatever you like. Enjoy your life and trust that your baby is on its way. That is how you use the Law of Attraction to get pregnant. I wanna ask you we should have visualization our desire everyday until manifesting that?Because we dont know how long it takes ,some days.some weeks,some months,…. I visualize pregnant or already having the baby? Helen – I believe Elizabeth says to always focus on the end result when using the law of attraction, even visualizing. Is your end result to get pregnant or to have a baby? Thanks for your reply. I really appreciate it! My end result is to have my healthy happy baby! I wasn’t sure if we should visualize both the pregnancy and the baby. The preplanning and dreaming about my baby, that is what I am going to focus on. Visualizing my baby. I have a question about manifesting love. What if I have a picture of the person I would like to manifest and would like to create a specific relationship with him, so it is a specific person I just haven’t met him in reality. With me being so specific can I manifest all the elements of the relationship and the person? Louise – Elizabeth explains how to use the law of attraction for love and to attract a specific person in her book, Manifesting Love.